Love the Chase hit it big as a broodmare when she gave birth to her first foal in 2011, a modestly-bred chestnut sired by Lucky Pulpit. That foal, of course, was two-time Horse of the Year California Chrome. 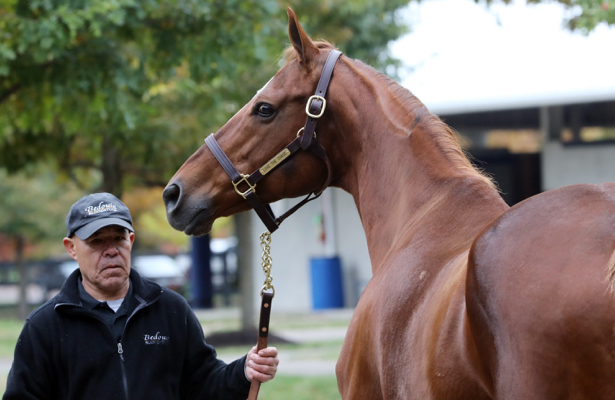 The 13-year-old mare moved from California to Central Kentucky in 2016, and SF Bloodstock’s Tom Ryan announced on Twitter Thursday that she’ll next visit Lane’s End’s new addition, Breeders’ Cup Classic winner Accelerate. Accelerate is training toward a start in the Grade 1, $9 million Pegasus World Cup on Jan. 26 at Gulfstream Park before he begins stud duties in Versailles, Ky. Ryan described the son of Lookin At Lucky as a "great looking colt that’s done it the hard way, has proven his mettle and clearly has our full attention." McCormack Bloodstock purchased Love the Chase for SF Bloodstock at the 2016 Fasig-Tipton November Sale for $1.95 million. She was in foal to Tapit at the time. A Maryland-bred daughter of Not For Love, Love the Chase was a $30,000 purchase at the Fasig-Tipton 2-Year-Old Sale in 2008. She raced six times at Golden Gate Fields, winning once, and made her last two starts for owners Steve Coburn and Perry Martin. Coburn and Martin bred Love the Chase to Lucky Pulpit in California and was taken on the ride of their lives after the white-blazed colt was born. California Chrome came out of state-bred competition to win 16 of 27 starts – seven of them Grade/Group 1 – and more than $14.7 million. Those wins included the Kentucky Derby, Preakness Stakes and Hollywood Derby on turf. That was all before Taylor Made purchased Coburn’s share in California Chrome in the summer of 2015. The horse went on to win the Dubai World Cup, Pacific Classic and Awesome Again Stakes at the top level. California Chrome now stands at Taylor Made Stallions in Nicholasville, Ky., for $35,000 and has his first crop of yearlings. Following California Chrome, Coburn and Martin bred Love the Chase to Lucky Pulpit three more times. She foaled the filly Hope’s Love in 2013, who placed at 2, the winning filly R Sunday Surprise a year later, and the ridgling Faversham, also a winner, in 2015. Lucky Pulpit died in February 2017 of an apparent heart attack at Harris Farms in Coalinga, Calif.
Coburn and Martin sent Love the Chase to Taylor Made for the 2016 breeding season. She was mated to Gainesway Farm’s Tapit before selling to SF Bloodstock and was bred to WinStar Farm’s Pioneerof the Nile the following year. Both foals were colts. Her Tapit colt was purchased by Coolmore’s M.V. Magnier at the 2018 Keeneland September Yearling Sale for $1.1 million. The Pioneerof the Nile colt went to Larry Best’s OXO Equine for $600,000 as a weanling two months later at the Fasig-Tipton November Sale. Love the Chase also went through the November auction ring in foal to Coolmore’s Uncle Mo. She RNA’d for $1.3 million.